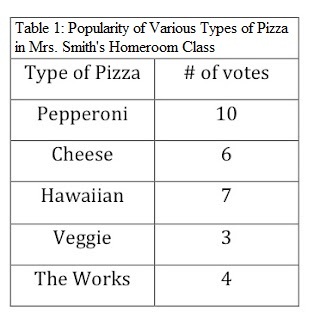 Some examples of data tables are shown below the text. Notice that each of them follows the conventions described. Title: The title describes the variables and what is being measured. If you are constructing a data table comparing different types of activities on heart rate, your title would read "The Effect of Different Physical Activities on Heart rate"
Variables: A variable is something that changes in an experiment. There are two types of variables: The independent variable is the variable that you control or manipulate. The dependent variable is the variable that changes as a result of you manipulating or changing the independent variable. All data tables have at least one independent variable and at least one dependent variable. If you are doing a science experiment, your data table should also include the control, the trial where the independent variable was not introduced or changed. Measurable Unit: For the data table to have meaning, use a measurable unit to compare the two variables. Examples of measurable units would be time (hours, minutes, seconds), length (centimeters, inches, miles) or degrees (Fahrenheit, Celsius). In our example, we are comparing the effect of four different types of activities on heart rate, so we would use beats per minute as our unit of measure. Repeated Trials: When comparing the variables, include at least three trials for each activity. Conducting more than one trial helps you to find an average and reduces the possibility of experimental error. For example, measure the heart rate for "walking" at least three different times. After completing three "walking" trials get an average heart rate for the walking activity. Repeat this step for each activity. Using a ruler for a straight edge, draw a grid leaving enough spaces for the data. Collect data and record in the appropriate box. Check data table for completeness or errors. ​*Note: the location of the independent and dependent variables can be switched on a data table; the independent variable can be on rows and the dependent variable can be on columns.